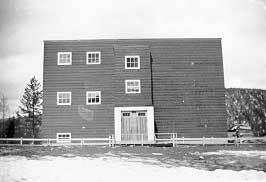 The original Wells-Barkerville school was built in 1934. This early school contained only one room and housed up to 70 students. School in a mining town tends to be a little bit unique. Our school was a conglomeration of several buildings. The junior grades were in the central 4 room building while grade 9 & 10 shared a one room building and grades 11 & 12 another. The heating for the one room buildings was an iron pot bellied stove. Being a hunting community, bullets were always available. Not a week would pass but someone would drop a few live bullets in the hot stove and a few minutes later all hell would break lose when they started to explode. Of course the cast iron confined the explosions but it sure made a racket35. A second school was constructed in the early 1940's. This was a four room building, to which additions have been added creating the existing school building. A second floor (with 4 more rooms) was later added, due to the increase in the population in Wells, and in the 1960s, a gym became the latest addition. The school today has an enrolment of approximately 27 students, and is under threat of closure. Talks are underway to create an adult learning school on the second floor of the school, to enable it to stay open. Island Mountain Arts courses are held in the school building during the school holidays.